So Long Damage Iron Tamer is rated 5.0 out of 5 by 1. 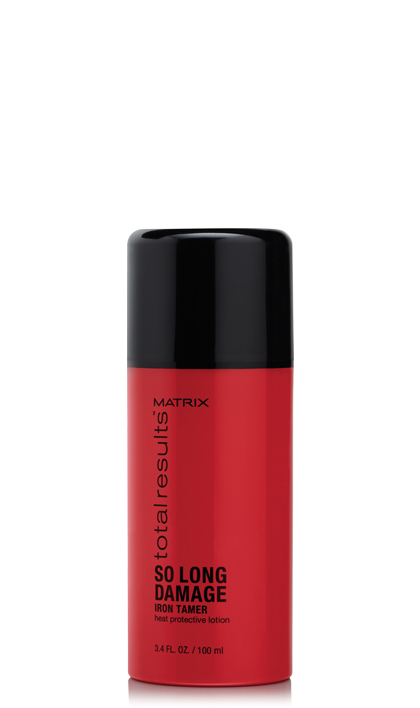 Share https://www.matrix.com/total-results/products/so-long-damage/so-long-damage-iron-tamer So Long Damage Iron Tamerhttps://www.matrix.com/~/media/images/haircare/totalresults/so long damage/total_results_so_long_damage_iron_tamer_tr-sld-it.jpg Protect hair against high heat damage for an easier, gentler heat styling process. Rated 5 out of 5 by alyandhaydensmom from Great product! I use a flat iron often. This product protects my hair from damage and also gives my hair a more silky and smooth finish. It has been great for the dry winter weather so far. When using this product, my hair does not have static or flyaways. Also, a small amount is needed for my hair.